Adobe Fireworks CS6 has some tools that work differently than similar tools in other Adobe applications: the bitmap tools of Blur, Brush, Eraser, Lasso, Magic Wand, Marquee, Pencil, and Rubber Stamp. If you don’t see the Tools panel, choose Window→Tools. Choose File→New to create a new Fireworks document. The New dialog box appears. Type 500 in both the Width and Height text boxes; leave Canvas set to White; then click OK.
A new, blank document opens. Use the Marquee tool to click and drag in the workspace from top left to bottom right to create a rectangular marquee. Choose Window→Swatches to open the Swatches panel. Click any color you want to use for the fill of your selection. Click the Paint Bucket tool (in the Colors section of the Tools panel) and then click inside the selection marquee to fill it with your selected color. You’ve successfully created a bitmap graphic in Fireworks. You can use the Marquee tool to move the pixels to another location. If you’re a Photoshop user, notice that the Marquee tool works just like the selection tools in Photoshop. With the Marquee tool, click and drag over the bottom of your bitmap rectangle. Select the Pointer tool and then drag the marquee down. Choose Select→Deselect or use the keyboard shortcut Ctrl+D (Windows) or Command+D (Mac), to make sure you have no active selections. Hold down the Marquee tool to select the hidden Oval Marquee tool. While holding down the Alt (Windows) or Option (Mac) key, click and drag from the center of the rectangle you created. 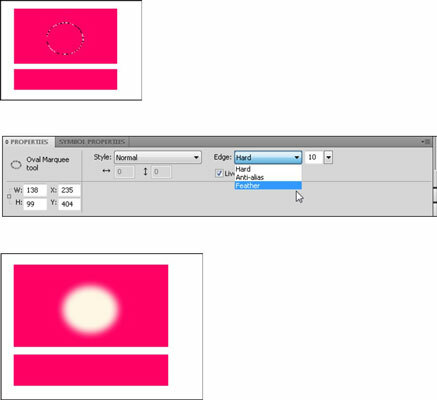 Many shortcuts you use in Illustrator and Photoshop also work in Fireworks — but not all. Finding compatible shortcuts is sort of hit-or-miss when you’re in the beginning stage with Fireworks. For details, choose Help→Fireworks Help and select Preferences and Keyboard Shortcuts from the list of topics on the left side of the Help window. To feather (soften) the edges of the selection, choose Feather from the Edge drop-down list in the Properties panel and set a feathering value (10 pixels is the default) in the combo box to the right of the Edge drop-down list. Press Ctrl+X (Windows) or Command+X (Mac) to delete your feather selection.